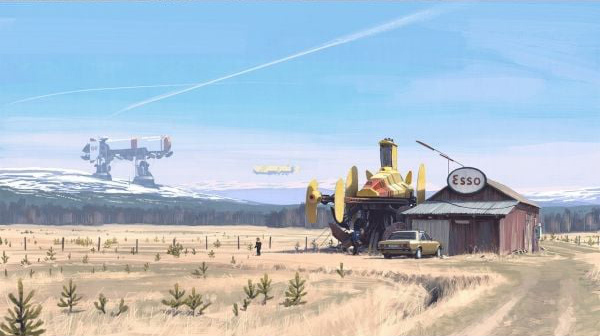 With a long-standing interest in future visualizations at the bivouac, the style and substance of Simon Stålenhag’s illustrations has left quite the impression. 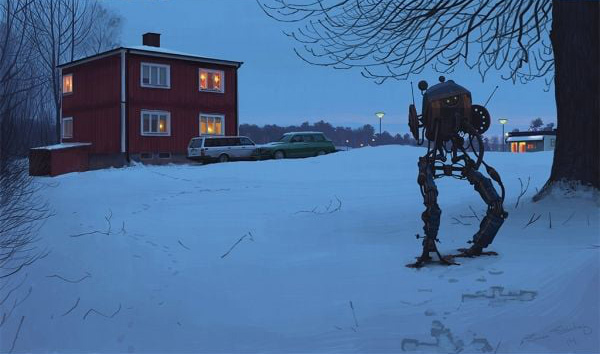 Stålenhag’s masterful illustrative technique is remarkable in and of itself, but his unique ability to seamlessly blend the world we know today with new and unfamiliar future technologies makes his work truly distinct. Stalenhag’s command of visualizations is so powerful that he has created mini-stories that are self-narrative. His Illustrations portrait powerful story arcs on their own without the need of the written word. Stålenhag is particularly skilled at capturing an expansive sense of scale. He does this through placing large, fascinating, futuristic objects into what would otherwise be commonplace landscapes. This juxtaposition, often accompanied with a remarkable command of lighting and a clarity of focus applied to certain areas of the composition, further enhances a dramatic sense of expansiveness. 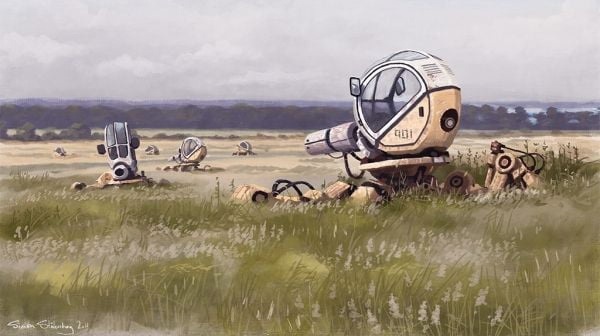 Another device Stålenhag uses in some story lines is placing human beings in what appears to be vulnerable contexts when juxtaposed with new forms of technology. Children or parents with children can often be seen navigating a landscape strewn with disused “old future” technologies or avoiding those that seem to be searching for them. The placement of today’s emergent technology in such matter-of-fact settings and often applying an aged patina to technologies we have yet to come to know is powerful. Work like this can help encourage us to ask important questions about the technology we are bringing into the world at an increasing pace and why we might want to think more carefully about doing so. 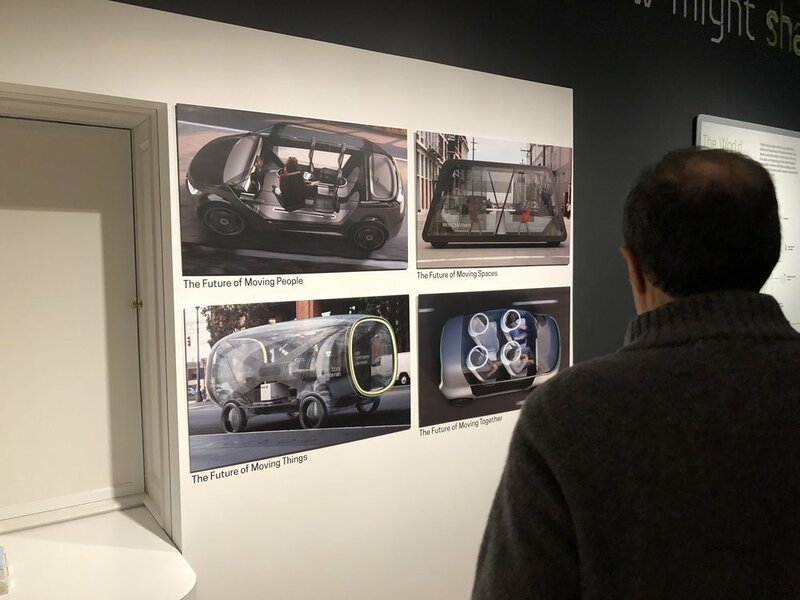 It is such a pleasure to see work from IDEO’s four part exploration of “The Future of Automobility” included within the Cooper Hewitt’s “The Road Ahead: Reimagining Mobility” Exhibit. On view at the New York’s Cooper Hewitt through March 31st, 2019, the exhibit explores how we might move people, things, spaces and information in the 21st Century and beyond. Innovative concepts, prototypes and simulation work exploring how future forms of mobility and new approaches to urban planning might emerge are featured from leading companies working in the mobility domain. 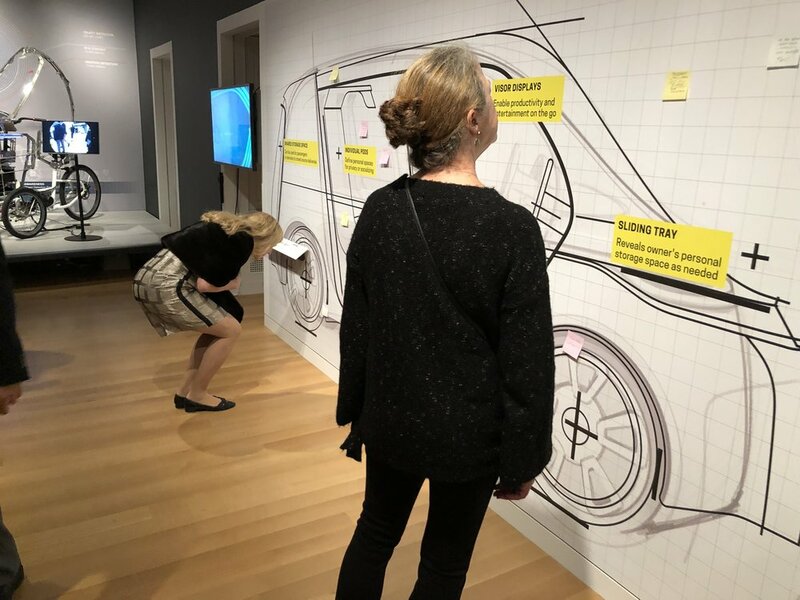 Visitors are prompted to capture their own hopes, needs and desires for future mobility on post-it notes and to place them upon a life-sized sketch of a vehicle designed to support shared mobility. Concepts created for the Future of Automobility series exploring moving people, things, spaces and together are on view within the exhibit space.